(a) Using SST, install a new rear No. 1 differential mount cushion. Install the rear No. 1 differential mount cushion so that the protrusion is positioned upward. Install the rear No. 1 differential mount cushion within +/- 3° from the center. Temporarily install the rear No. 1 differential mount cushion to the rear suspension member before installing SST to prevent the rear No. 1 differential mount cushion from being tilted. Apply grease to the threads of the SST bolts before use. Be sure to use SST in the correct combination. Do not set SST in the wrong direction. Make sure that SST contacts the entire rear No. 1 differential mount cushion seating surface. Do not slant the SST bolts. 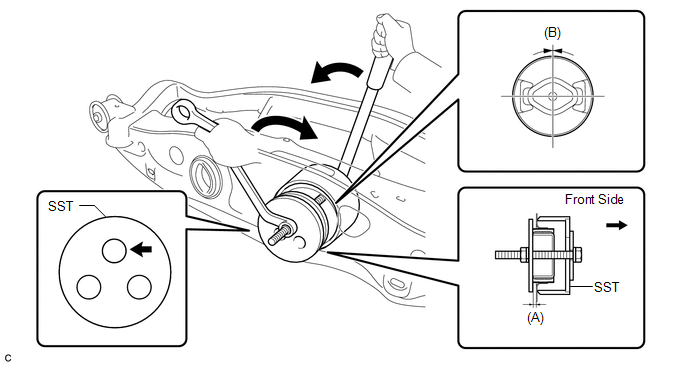 Tighten the 2 SST bolts equally into the 2 rear No. 1 differential mount cushion holes. 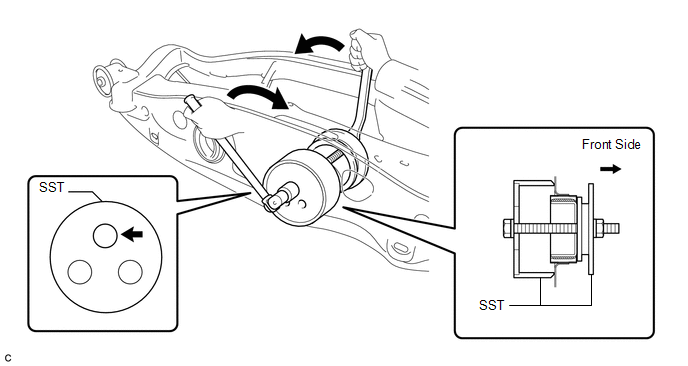 (a) Using SST, install a new rear No. 2 differential mount cushion. Install the rear No. 2 differential mount cushion within +/- 3° from the center. Temporarily install the rear No. 2 differential mount cushion to the rear suspension member before installing SST to prevent the rear No. 2 differential mount cushion from being tilted. Make sure that SST contacts the entire rear No. 2 differential mount cushion seating surface. 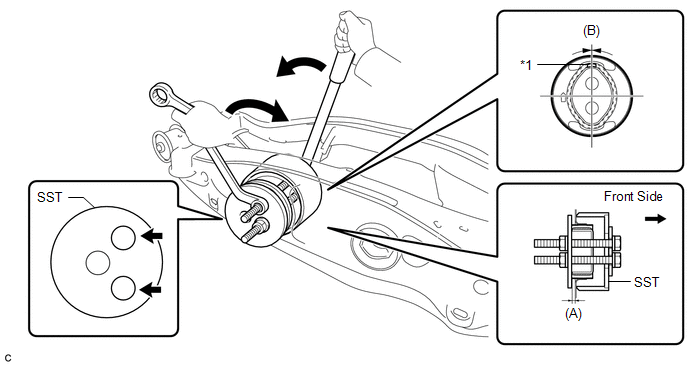 Refer to the procedure from Install Rear Differential Carrier Assembly with Differential Support (See page ). 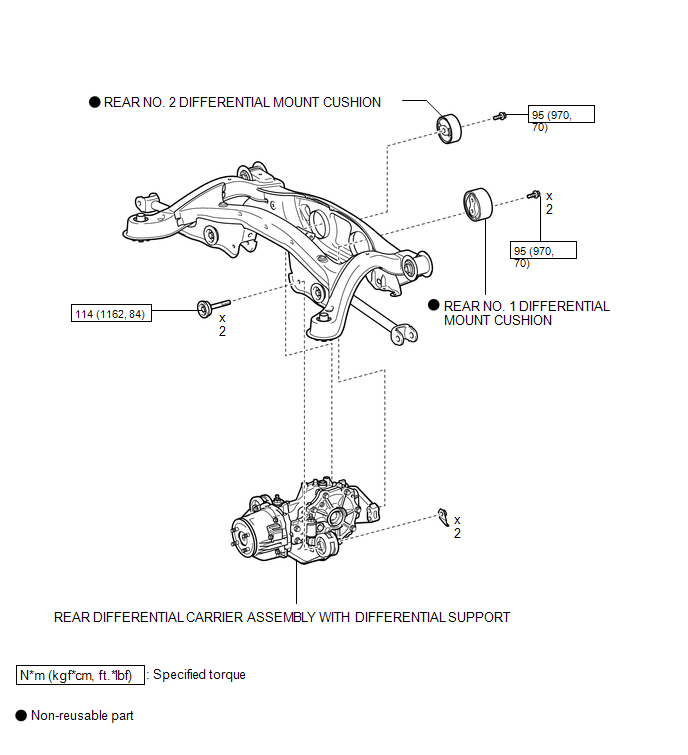 Refer to the procedure up to Remove Rear Differential Carrier Assembly with Differential Support (See page ). (a) Using SST, remove the rear No. 1 differential mount cushion. 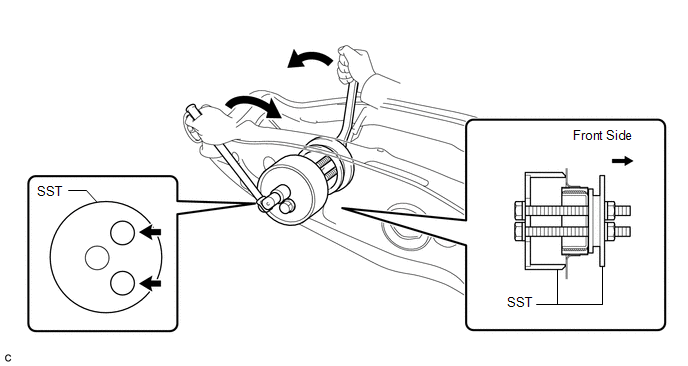 Do not bring SST into contact with the rear suspension member. (a) Using SST, remove the rear No. 2 differential mount cushion.